Growing at large landscapes, one of the strengths of the Ottoman Empire in that period, was their inclusive and tolerant approach to the people from the other nations and religions that they have conquered. Many nations that were ruled under the Sultan brought many things to the daily life in political means, traditions and…well.. culinary ways as well. Especially culinary additions to the Ottoman cuisine are well worth to mention and it is engraved into today’s Turkish cuisine. Circassians, Cretans, Balkan people, Middle Eastern provinces and many others brought their own culinary skills to the table, influencing the Anatolian cuisine as well as the Ottoman cuisine at the palace. I noticed the lingering effect in my family since my grandfather’s family (maternal side) was from, now what is called Crete region. My grandma learned cooking from his side of the family, and when I ask now about a dish, I realize the origin of some dishes that ties me back to those ancestors. One group of people, Albanians, were in this mix as well. 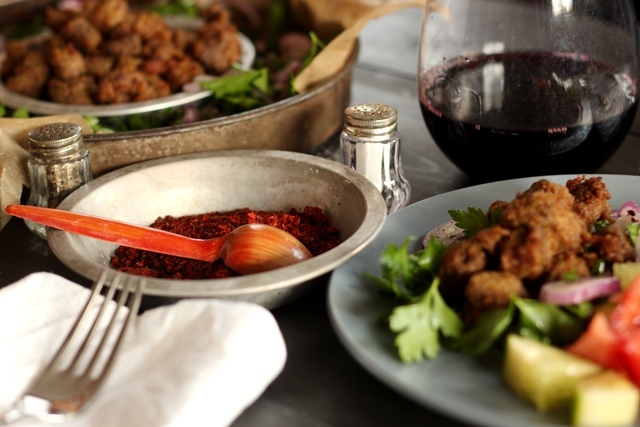 The Albanian liver stayed in Turkish cuisine as one of the most-sought mezes (tapas) at our raki tables. If you don’t know what raki table is, here is the post for you. 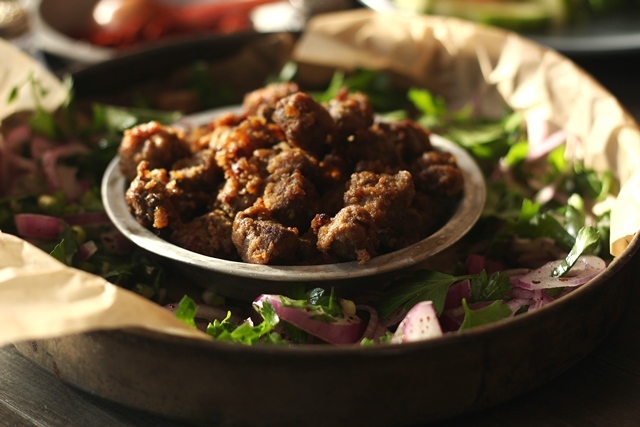 The liver dish goes well with onions rubbed with salt and sumac on the side and served as a small dish with your raki. The best to use is lamb liver due to better flavor but if beef or veal liver is available, you can go with that. We normally order it at the restaurants but this time I could not resist to make it at home. I found that it is easier to cut the liver in small cubes if you let it freeze almost all the way through, and then cut in small pieces. Otherwise, it is very soft piece that makes it hard to make clean, equal cuts. As soon as I land in Istanbul, there will be a meyhane night and this will be in the usual order! 1. Cut liver in small cubes. Sprinkle salt and Aleppo pepper. Let it rest (or thaw if you cut from frozen)for 30 min if not frozen. 2. Drain any juice collected on the bottom. Coat with the flour all over. Let it rest for another 30 min. 3. Heat the oil in a frying pan. Shake off the excess flour. Fry in batches for several minutes. 4. Place it on a paper towel-lined plate to get rid of the excess water. It looks like the kind of dish I will love too. Looks really flavourful! I love liver too, although I have never tasted lamb liver. I looked at your raki post from last year and your brother does have a wonderful smile :) I’m sure you’ll be happy to see him again. I’ve eaten lamb liver and it’s great! I rarely see it in my markets, alas (and liver in general has gotten much more scarce in the last few years – I guess it’s not as popular anymore). Anyway, terrific recipe! Such good stuff – thanks. And I hope you have a wonderful holiday. I love the concept of the Raki Table- sounds lovely. Similar to the Spanish tapas tradition, no? The photos of your liver are flat out gorgeous! I hope you’re having a wonderful Christmas! 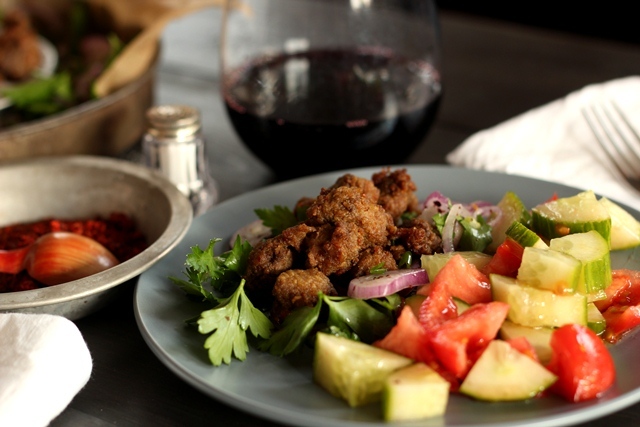 The crispy liver looks great with the fresh onion salad! Happy early New Year to you! i love liver but i will say that i have never had lamb liver before. i don’t even know where i could buy it! it is my goal this year to try even more cuisines, turkish being one of them, all because of this dish. 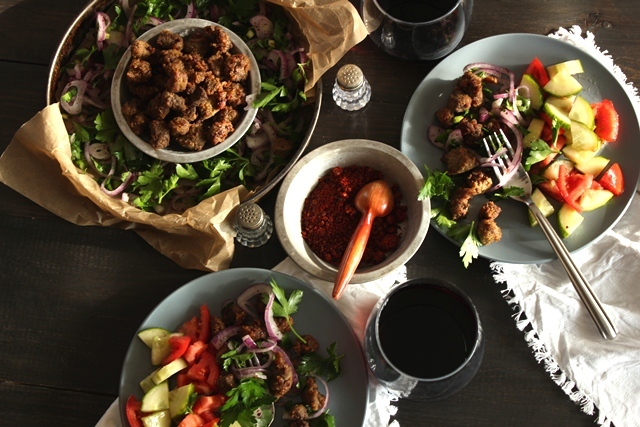 I love Turkish cuisine, this particular recipe is so unusual and interesting! I am intrigued! I have not tried Lamb Liver but the first I ate chicken liver was the one hubby’s niece cooked us in Istanbul. And I’m in love with it ever since.